Valentine's Day, as well as being the traditional day when people admit their love for each other, is also the day birds choose their mates according to folklore. When ev'ry fowl cometh to choose her make (mate)"
Folklore also says that girls would be well advised to notice what bird they first see on Valentines day in order to divine who they will marry. Seeing a robin means a girl will marry sailor. A sparrow indicates her husband will be poor, but they will have a happy marriage. Seeing a goldfinch means she will marry a rich man, while seeing a dove means she will wed a man with a heart of gold. Seeing an owl means she will remain single - perhaps wisely so. 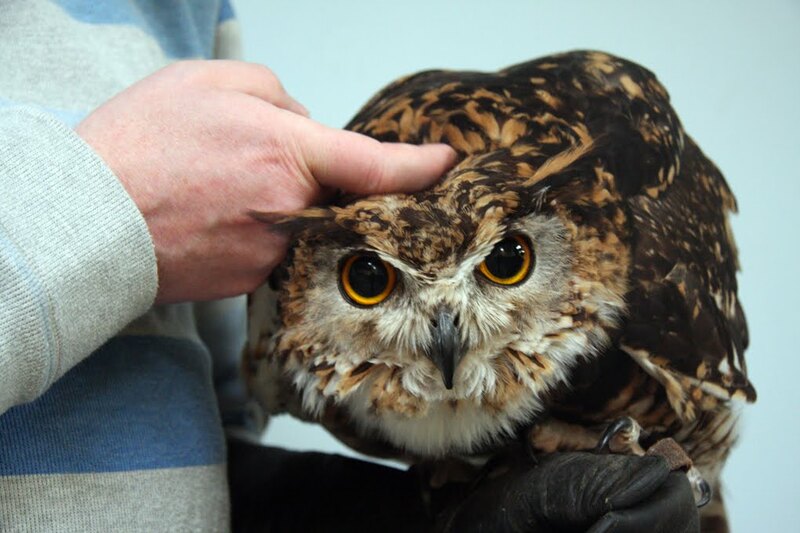 An old custom in the west of England was for three single young men to go into the woods and fields before sunrise on Valentine's Day to catch an old owl and two sparrows. If they were successful and could bring the birds to the local inn before the women of the house were awake, they were rewarded with breakfast. Maybe they got a kiss from the women too, as just getting breakfast seems a pretty small reward to me. The photo above shows my husband with an owl - maybe I should treat him to breakfast?